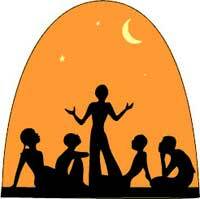 Recently, in our Spanish (intermediate and advanced levels) we have focused on telling stories. While the objective is to use the language for communication purposes, we have been trying to find situations in which we can explore different ways of telling a story. We have tried the PechaKucha format of presenting, digital story telling using SonicPics, among many. However, the tasks we have enjoyed the most is turning songs into stories and adding excerpts of the original song, as well as other sounds that can add to the atmosphere of the story we are trying to tell. 1. first we picked a song that has an interesting story. 2. we wrote the main events on a time line. 3. we thought of situations that could happen between the events we have identified and then add happenstance or, simply, additional information that allows us to expand the story. 4. we reached out for different moments that characters can celebrate, or that allow us to get a deeper insight on them. 5. we included ideas that can provoke further discussion. 6. we tried to finalise the story mosaic, making sure we have as many nuances, colours and sounds as possible. Here is an example of a song called “Hijo de la Luna”. A song by Spanish band, Mecano, where a woman gives her first child to the moon, as the moon helped her get the man she wanted to love. This entry was posted in ATL, Collaboration, IB DP, IB MYP, Resources, Strategies and tagged ATL, Foreign language learning, IB DP, IB MYP, songs, spanish, Storytelling. Bookmark the permalink. I was thinking that other songs that lend themselves well to this type of activity are ballads. Take the ballad of ‘Lord Randall’. Fantastic ballad and amazing story which also requires critical thinking skills to figure out who killed Lord Randall. Love the idea and will try is as soon as possible. I love incorporating songs in the teaching and learning. Quite an interesting way to web a story. We had our music and homeroom teacher work together In grade 3 on a unit about ‘ Animals’ under the theme ‘ Sharing the planet’. Students listened to a song, ‘ Everything beneath the sea’, developed a story and infact a group of students further added lyrics to the existing song based on the story line.